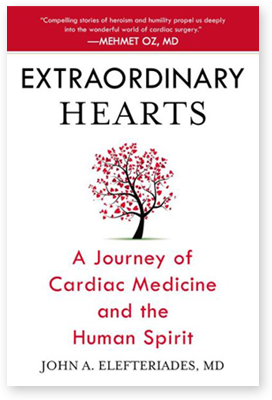 Cardiac surgeon Dr. John A. Elefteriades, one of Men’s Health magazine’s ten best doctors in America, shares moving patient stories and lessons about the human heart. Dr. John A. Elefteriades, is the William W.L. Glenn Professor of Cardiothoracic Surgery and Director of the Aortic Institute at Yale University and Yale-New Haven Hospital. He is among the most clinically active academic surgeons in the country and serves on multiple scientific advisory and editorial boards. He is the author of House Officer Guide to ICU Care (1st, 2nd, and 3rd Editions), Advanced Treatment Options for the Failing Left Ventricle, Diseases of the Aorta, Your Heart: An Owner’s Guide, The Woman’s Heart: An Owner’s Guide, Acute Aortic Disease, and Controversies in Diseases of the Aorta. He is also the author of the medical thriller Transplant, which was a finalist in the Next Generation Indie Book Awards as a best first novel. © Dr. John A. Elefteriades, MD All Rights Reserved. Site developed by THINK creative group.